I am happily back in Canada, but with a few more blogs still percolating in my old brain. I wrote about my visit to Colonia Guell in an earlier post, an experimental factory town on the outskirts of Barcelona. I wanted to see Gaudi’s church. I found it fascinating, the visit one of the highlights of this time in Spain. He also built a number of large private homes for wealthy merchant families, gentrification on a grand scale. 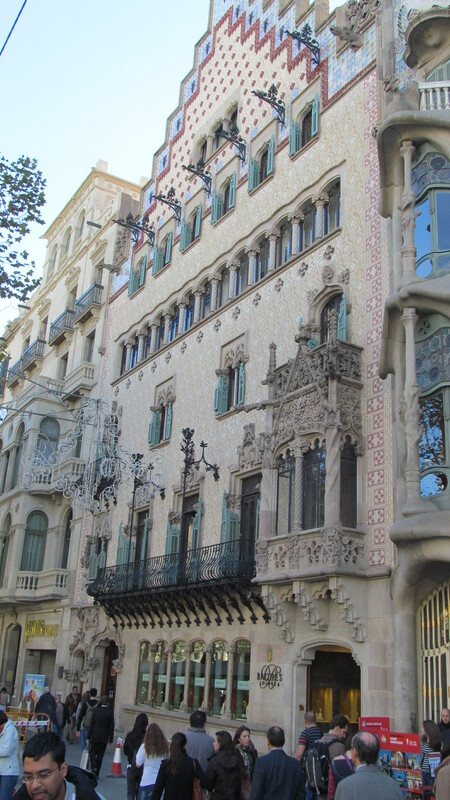 Casa Batilo presides over one of Barcelona’s principal thoroughfares. It was built at the beginning of the 20th century. 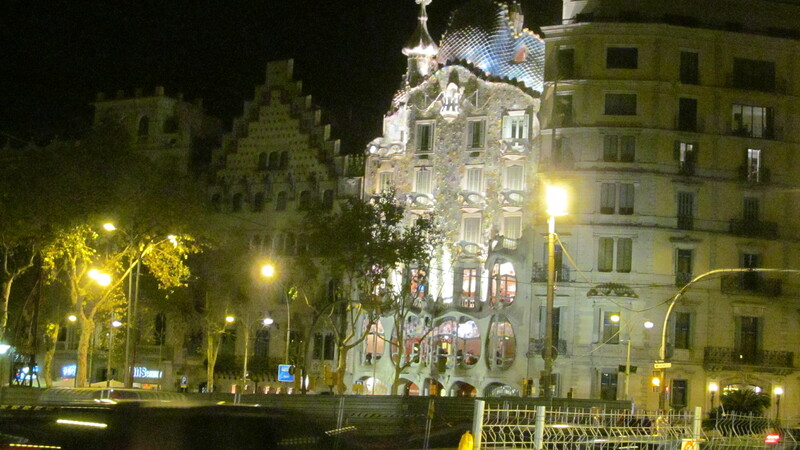 I have chosen this night photo; it conveys well the sense of the fairytale that is my primary impression of this place, fun to visit, on everyone’s must list when visiting Barcelona “but now I want to return to my own home”. Six stories and in every room, in every component, in every detail of the interior and exterior, the architect’s vision dominates absolutely. I am left wondering whether the family had any input whatsoever. Beautiful elements such as this mirrored cupboard door abound. 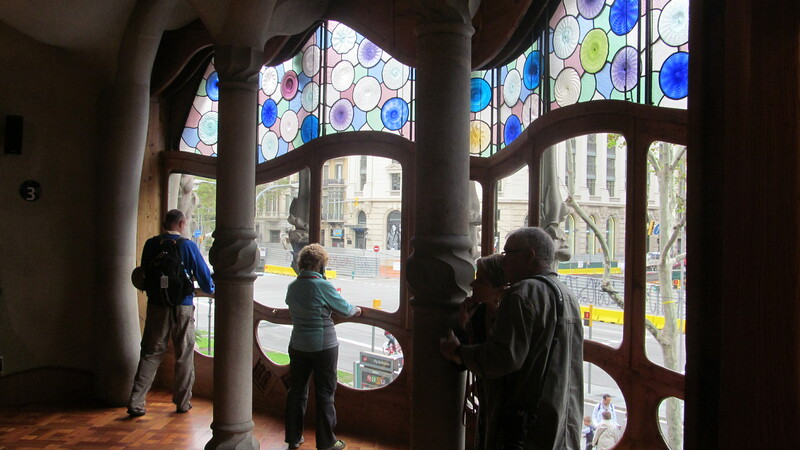 Every element, including the furniture, window, doors and even doorknobs, was designed by Gaudi. 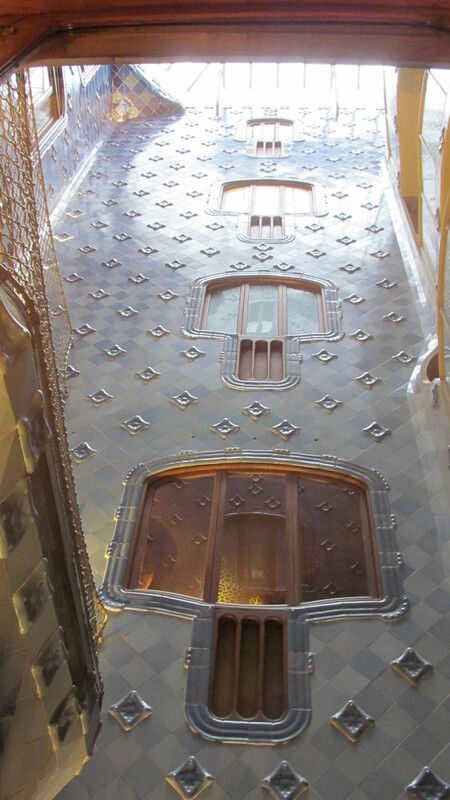 Bringing light into every corner of the house was one of Gaudi’s obsessions. And, he evidently did not like straight lines. The pieces of glass would have each been designed by him, many are spirals and suns. There are two openings within the house, shafts to bring light and air to all of the interior rooms on every floor. 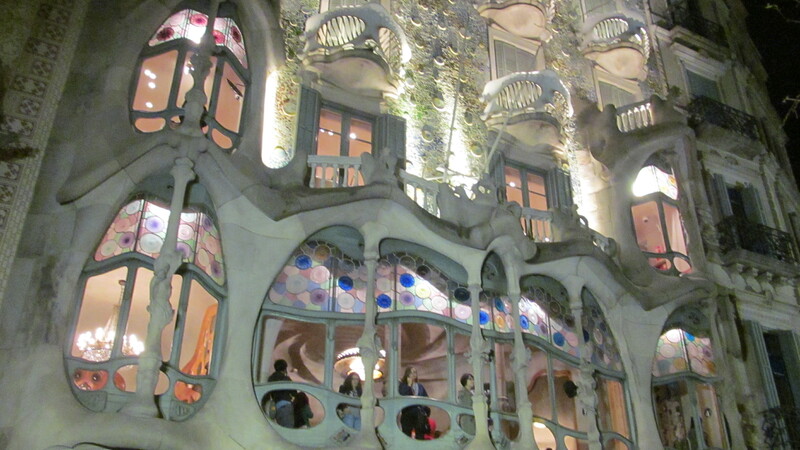 Gaudi was an engineering as well as an architectural marvel. The unusual section below the windows would be for air circulation, another one of his obsessions. 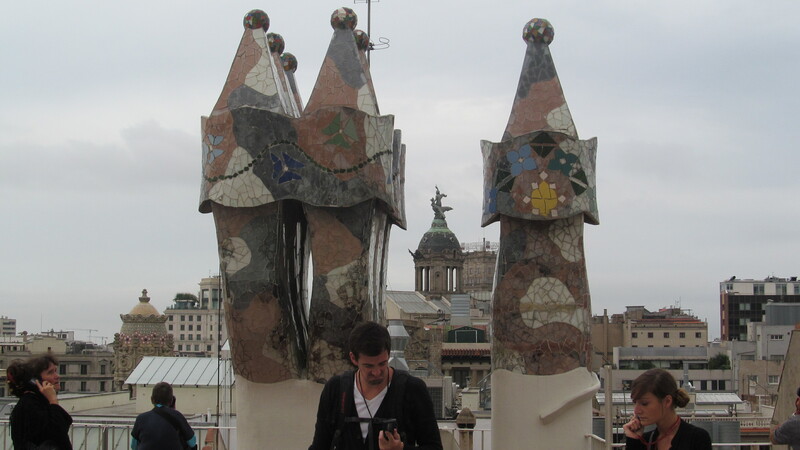 The roof is a whimsical world for chimneys covered with recycled pieces of ceramics and sculpted shapes. A few final photos – it was very challenging with the crowds and with the sheer number of interesting elements and curiosities. The front balconies and windows conjure up carnival time. Oh, and next door is very interesting also, from the same time period, by a well-known contemporary, Puig i Cadafalch. It is an absolute delight to wander the streets of this city to enjoy its architectural treasures and amazing diversity. I see this delight in the visual everywhere in Spain. But architecture creates environments; I am like you, I am clearly less comfortable in some of these created spaces. Could you live in the mad King Ludwig’s fairytale castle in Bavaria? Could be fun to visit for a few hours? I personally would not have felt at home, would not have felt any sense of sanctuary in Casa Batilo, from what I have seen of it. I found a great website if you are interested in seeing more of it. It has many photos organized under the different kinds of elements and materials. There is also an album of historical photographs of what it would have been like a hundred years ago. Enjoy. If the link doesn’t work directly, consider simply typing in ‘gaudidesigner.com’. His other buildings are probably also featured. I am going to check it out as soon as I publish this blog. 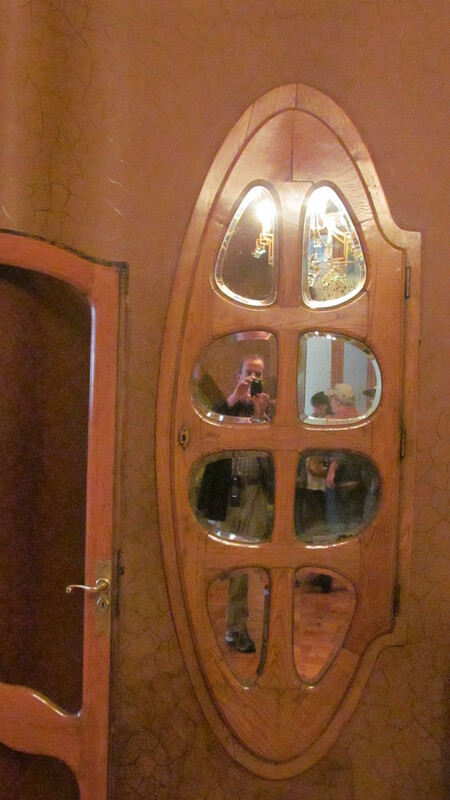 This entry was posted in Barcelona, Casa Batilo, Gaudi, Spain, travel in Spain, Uncategorized and tagged Casa Batilo, Gaudi, modernismo on November 16, 2012 by agnotarte.